Here are 10 tips to make your doll photographs shine, especially with digital photos. Learn more here about how to get the most out of your doll photos. Prices of good digital cameras, both single lens reflex, and prosumer cameras are way down, and point and shoot digitals take better photos than ever! Once you are freed from the tyranny of photo developing labs and the cost of film, you can experiment with your doll photos in many new ways, and you can fine-tune which techniques work for you without waiting hours or days for results from each batch of photos you take. Digital cameras will also streamline the process for getting your photos on the internet. If you prefer to print your photos, affordable home photo printers have also improved, and multi-megapixel cameras will give you photos sharp enough to print even in large sizes. The number one mistake that doll collectors make when taking photographs of their dolls is not getting close enough. If you are leaving large amounts of space all around the doll or dolls in your photos, you are not close enough! Don't be afraid to pull in tightly to the doll. Also, don't be afraid to take photos of the doll which are not head to toe--doll photos are often more dramatic if you take the photo from the waist up, or even as a close-up of the doll's face. Nothing ruins a photo of a doll faster than low lighting or heavy shadows. If your photography budget is small, you can get bright lighting by shooting outdoors. If you are shooting indoors, use a flash with reflectors and/or diffusers. If space and budget allow, stationary photo lights can be ideal. If using multiple flashes or photo lights, experiment with the directions of the light for the most flattering photos. Just the smallest shake of your camera will blur your doll photo and ruin the sharpness that you need for a good quality doll photo. Using a tripod is the best way to cure doll photo blur, and there is really no excuse to not use a tripod when shooting dolls--they don't move, after all, so you don't need the flexibility and mobility that hand-holding the camera allows. For long exposures, couple use of the tripod with the camera's self-timer to avoid all possibility of camera shaking. If you absolutely can't use a tripod, it helps to have a camera with some sort of vibration control. 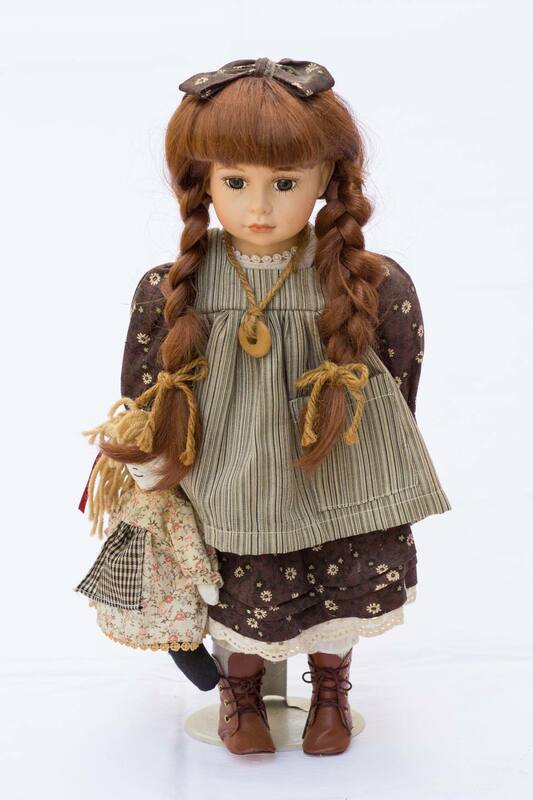 If you shoot under incandescent lights, fluorescent lights, or on a shady day, the color balance of your photos can be way off, which will not show the true colors of the doll you are photographing, not to mention that a greenish skin tone is quite unattractive on nearly all dolls. You can correct the white balance in most digital cameras by using the white balance control. Simply pick the type of light you are shooting under or use photo editing software. Have you ever seen a photo on eBay taken on a kitchen table, with the refrigerator and sink clearly visible in the background? Not a pretty picture, is it? There is no excuse for a cluttered background behind your dolls. It is ideal if you can use cloth or photo paper to create a seamless background for your doll photo. If you cannot do that, at least pick a spot to photo your dolls which is relatively uncluttered, and then shoot the doll at a low f-stop to blur the background so it is less distracting. 7. Get That Doll's Hair Out of Her Face! Nothing can ruin a well-shot doll photo faster than a stray hair running across the doll's face--it can look like a crack, or just be plain distracting. Messy hair can make any excellent condition doll look tired and in worse condition than she actually is. Brush and style your doll's hair well prior to photographing, and then check for stray hairs right before you shoot. Trust me; it is much more time-consuming to try to edit the stray hair out of the picture later in your photo-editing phase. Some dolls look better when photographed from a slightly high angle, others look better when photographed slightly low or to the side. Consider several angles before you shoot and pick the most flattering one. Find an affordable, easy to use photo editing program and learn to use it--you can then manipulate even non-perfect photos so they look great. The best known is Adobe's Photoshop, which is expensive but very versatile. 10. Hide the Doll Stand! Your doll photo will look more professional if you can hide the doll stand (or not use one). See if the doll will balance alone, and if not, you can cut a hole in the fabric, hide the stand base underneath and the vertical part of the stand behind the doll. Quake wax does wonders for standing up small dolls with no stand!